You may have read about how Thailand is divided country, with opposing groups of people some of whom identify themselves as ‘Yellow Shirts’ and other who identify them as ‘Red Shirts’. 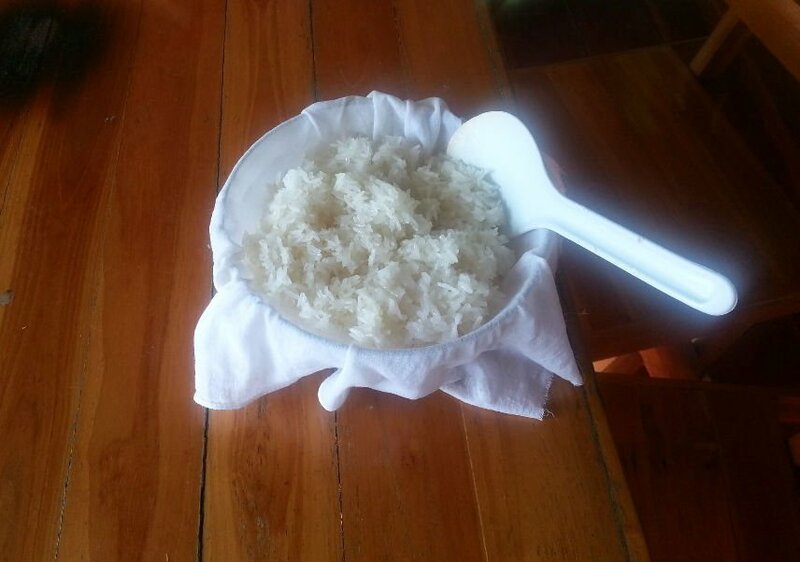 However, there is a more fundamental division in Thai society than this and that is between the people who mostly eat plain rice (predominantly from the Central and Southern regions of Thailand) and those who tend to eat sticky rice (mainly people from the North East region and to a slightly extent from the North region). First thing to know about cooking sticky rice is that you do not cook it in the same way as plain rice. If you try the ‘absorption’ method with sticky rice you will just end up with a blob of inedible hard starch. Second thing to know is that sticky rice is a special type of rice. You cannot make sticky rice from normal long grain or jasmine rice. For sticky rice you need a different cooking method, and this particular method is the one which my Thai wife uses. My wife’s family farm sticky and she has been cooking it every day since she was a little girl, so do not be put off if you find that the first few times you try to cook sticky rice you try you fail. It takes practice. Step 1: Soak the sticky or at least three hours in a bowl of water. My wife leaves the sticky to soak overnight out of the fridge to be ready to cook in the morning. Step 2: Drain the sticky rice and then steam over pure water for about 20 minutes. 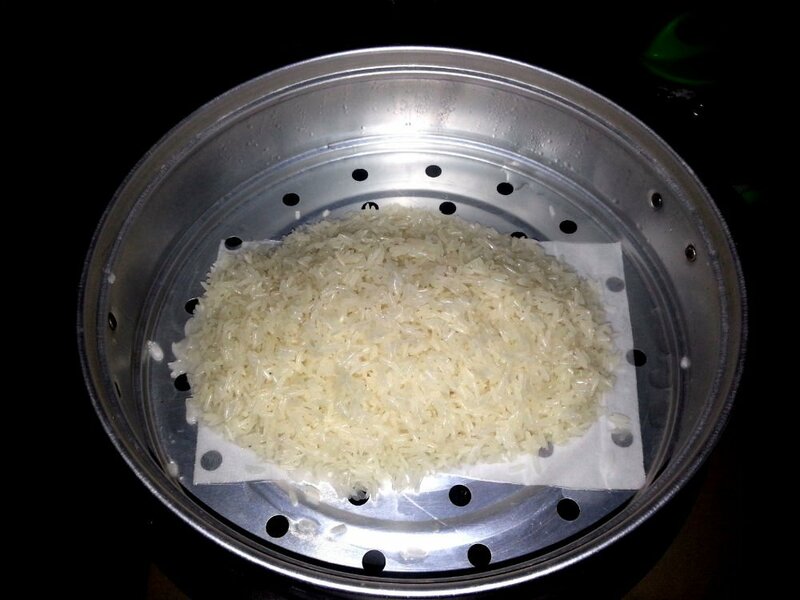 My wife steams the sticky rice in a piece of muslin cloth because the holes in our steamer are large and the rice would fall through otherwise. If you have a steamer with a finer mesh you don’t need to put the rice in a muslin bag. Step 3: Once the rice is cooked by the steam take it out and stir it around in a bowl to separate the larger clumps to allow any pockets of water to evaporate or soak into the bowl of rice. Traditionally this process is done on a wooden board but for smaller quantities you can do it in a bowl.